I found it when I reached the corner of Sebastopol and Le Ber streets, where an uninterrupted view of the Canadian National rail yard, the Nordelec building, and Montreal’s downtown appeared in front of me. All in one wide sweep. Clearly the landscape of the Point in this very place was marked by its experience and its history. My next challenge was to decide how to engage with this particular location, and create an intervention that would be the result of my observations during my exploration of the neighborhood. I remembered how oddly quiet the streets were during my long walks in the Point. Only occasionally did I see people standing or sitting around, and talking to each other. Most seemed in a rush to get to their destination, and I wondered what living in The Point actually meant to the individuals and families who had recently moved into the area. Inspired by William Whyte’s statement that the most popular urban places are those that invite people to sit (preferably in movable chairs) and relax, I chose to create a temporary site for informal conversation and reminiscing in The Point. My intent was to provide a place where people could sit and share stories, and establish associations between The Point’s history and their current lives in the neighborhood. I would invite my class and neighbors to sit in folding chairs and have unscripted conversations. The chairs would be placed at the bottom of Sebastopol Street, where the view opened up, near the entrance to the Canadian National (CN) rail yard. I chose four yellow folding chairs for my intervention. According to The Wagner Report, yellow is the most likely color to get quick attention, it is also an indicator that something is new, and temporary. The easily transportable foldings chairs would accentuate the temporariness of the intervention. With a magic marker, I wrote Sit, Sit+Talk, Sit+Listen, Sit+Look, on the back of the chairs. I thought they looked good, and that the message was friendly. It poured on the day of my intervention. But the show had to go on. I carried the chairs down the street and carefully placed them near the chain link fence – where the view was most striking. 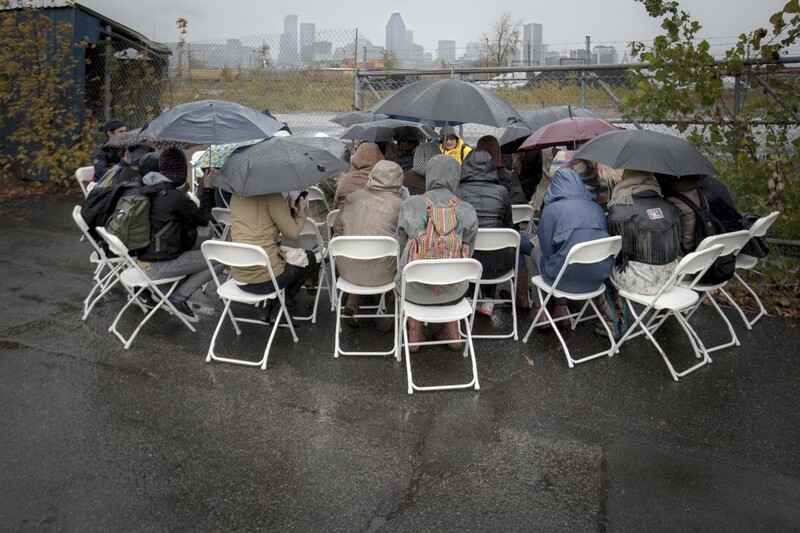 My valiant classmates sat down and huddled together, some of them seated in the yellow chairs, most others in white foldable chairs borrowed from Share The Warmth. No neighbors showed up, and I could not blame them for their absence. And so we talked. We talked about the view, the significance of Sebastopol street, the history of the CN rail yard, the CN workers’ lifestyles, the Grand Trunk races on paydays, the proposed construction of a sound buffer that would take away the view, and the re-use of the CN workshops. Many stories were centered around change that is inevitable. When all was said, we listened to my classmate Dario who had started to sing, and we all joined him in song. It was a pretty good time, sitting together, looking around, telling stories about the ‘hood’, and singing along with Dario. I will always remember that afternoon in the rain. It felt good to sit together for a little while, and reminisce about Pointe-Saint-Charles.